Services were held on 16 November 1966 at Arlington National Cemetery for United States Air Force Colonel Jack P. Voigt, 49, United States Attaché to Czechoslovakia, who died on 31 October 1966 after suffering a heart attack on the grounds of the United States Embassy in Prague. Colonel Voigt was assigned to the Defense Intelligence Agency and had been serving in the overseas post since June 1965. A native of Detroit, Michigan, Colonel Voigt attended Wayne University and the University of Maryland. He was commissioned in the United States Army Air Corps in 1942 and served in England and France as a bombardier, aircraft observer and senior navigator during World War II. Assigned as Director of Operations at the Pentagon in 1949, he returned overseas in 1952 as Assistant to the Air Attaché in Turkey. From 1956 to 1959, he served with Air Force Headquarters in Washington as Deputy Chief, International Affairs Division, Director of Plans and Programs. 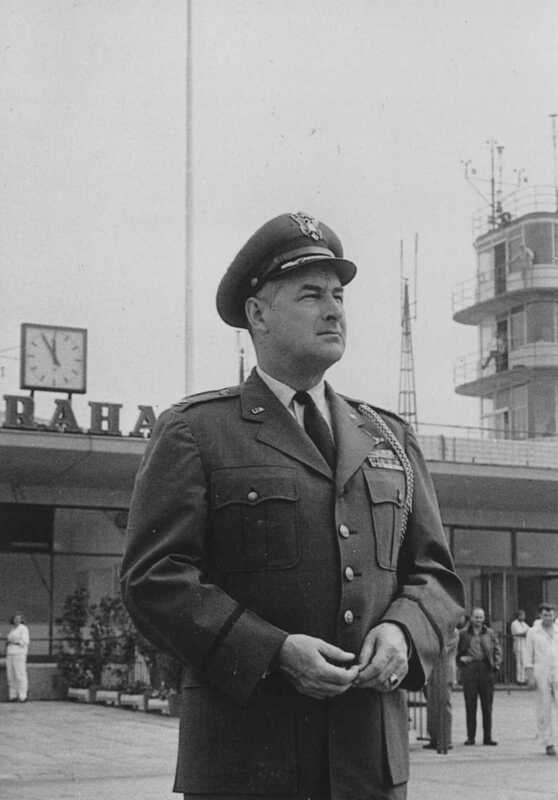 Colonel Voigt was then assigned to Spain with the Joint Military Group in 1959, where he served as Deputy Director of Plans and Chief of the Negotiations Division. He returned to the United States in 1962 to attend the Air War College at Maxwell Air Force Base, Alabama. Among his decorations were the Legion of Merit, awarded posthumously for his service as United States Air Attaché to Czechoslovakia, the Air Medal with one Oak Leaf Cluster, the Air Force Commendation Medal, the Turkish Air Force Wings and the Army Commendation Medal. The Colonel’s lady, Marion E. Evans, was a native of Moorestown, New Jersey. Marion worked for the War Department Signal Corps in 1941-42. She then joined the Women’s Army Air Corps in August of 1942. Staff Sergeant Evans served in England, Belgium and France. She met Jack in England and the rest was history. Marion was honorably discharged in August 1945. After their marriage, and while serving overseas, Marion’s efforts were spent with military children’s programs and the Red Cross. Between foreign assignments, she also worked as a Communication Specialist for the Department of the Army and the United States Atomic Energy Commission, both in Washington, D.C.
Marion Evans Voigt passed away on 18 July 2000 and was laid to rest in the Veterans Cemetery in Fernley, Nevada. She is also remembered at the Women’s World War II Memorial at Arlington National Cemetery, and Colonel Voigt’s name is on the wall at the Veterans Cemetery in Nevada.